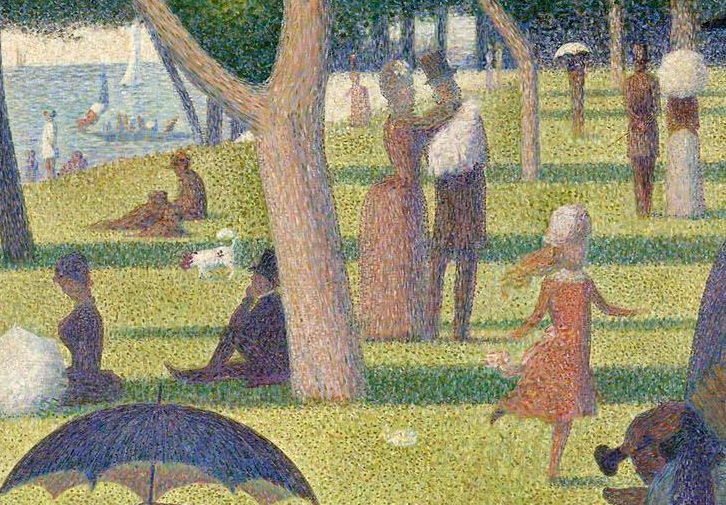 Georges Seurat, Un dimanche après-midi à l'Île de la Grande Jatte (A Sunday Afternoon on the Island of La Grande Jatte) (detail) (1884-6), oil on canvas, 207.5 × 308.1 cm, Art Institute of Chicago, Chicago, IL. Wikimedia Commons. With their Renaissance roots as cameos or backgrounds to figurative paintings, landscapes slowly evolved to be ‘pure’ and unpopulated. What started as figures (+ miniature landscape) became figures in a landscape, then a landscape with figures, and finally just a landscape. From the left: Rogier van der Weyden (1450); Jacopo Bassano (1545); Claude Lorrain (1662); Samuel Palmer (c 1833-4); Jean-Baptiste-Camille Corot (1834). All Wikimedia Commons. Some painters chose, or were driven to, landscape as a genre because they struggled to paint figures; this appears true of Samuel Palmer, for instance, who lacked classical training in painting the figure, and only attempted to place relatively small figures in his landscapes. 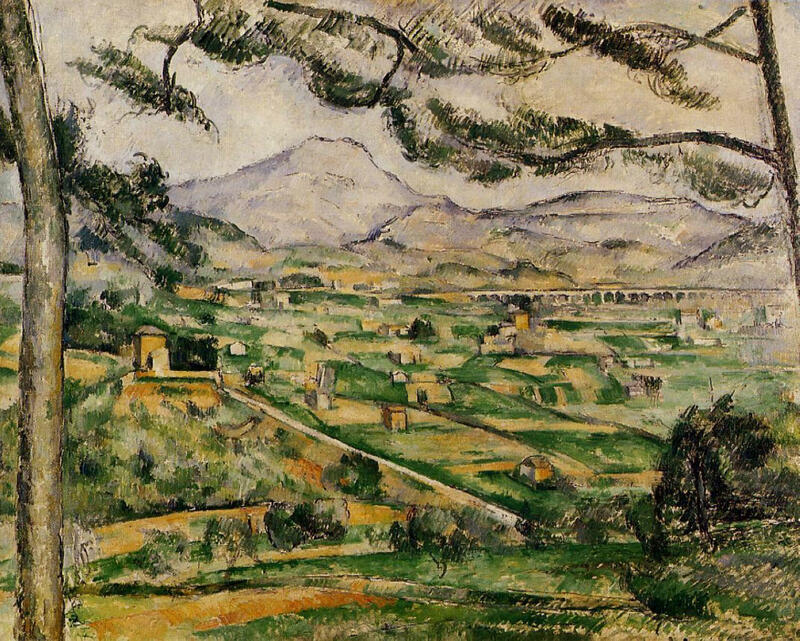 Although Cézanne painted some early figures in landscapes, his mature and late landscapes are completely unpopulated; his Bathers series ran in parallel, but their emphasis became the form and arrangement of the figures, and not the landscape. By the nineteenth century, and particularly in Impressionist painting, the great majority of landscapes were ‘pure’ and devoid of figures. 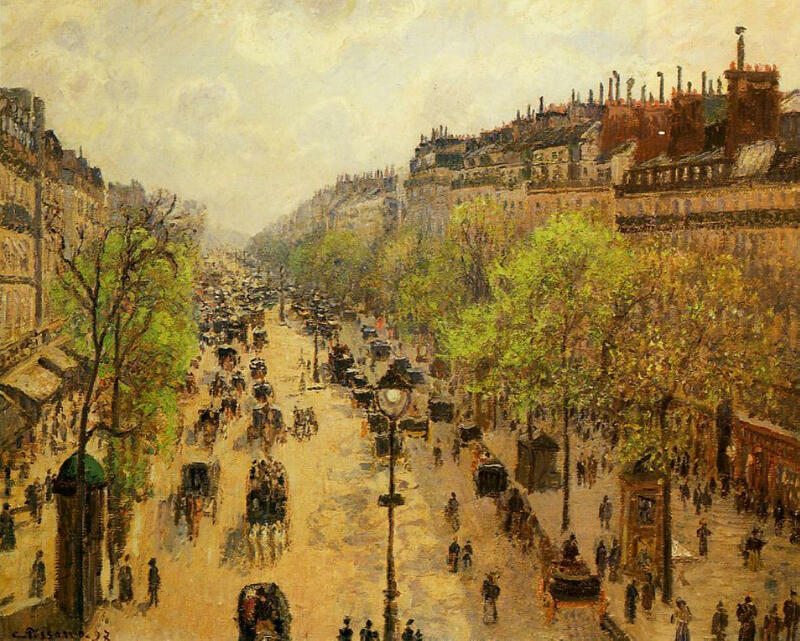 Even in cityscapes with many figures, such as Pissarro’s depictions of Paris, those figures contain relatively little of interest: they move and act fairly uniformly, and are staffage rather than subject. In the twentieth century, staffage was a topic of controversy in landscapes. Some artists liked to add accessory figures, little decorations to ‘brighten up’ the motif, others scorned such devices and expressed open deprecation. There is, though, one type of landscape (which I have not seen analysed in this way elsewhere) in which figures and other ‘enhancements’ appear to be used quite differently: what I refer to here as the ‘Advent Calendar’. Many countries which celebrate Christmas mark the build-up to the festival with small calendars, in which each day is accompanied by locating and opening a small recess, which contains a sweet or gift, and revealing an image forming part of the narrative of Advent: an Advent Calendar. There are landscapes which seem to work in a similar way, with many elements of a bigger narrative or meaning which are scattered around the picture. 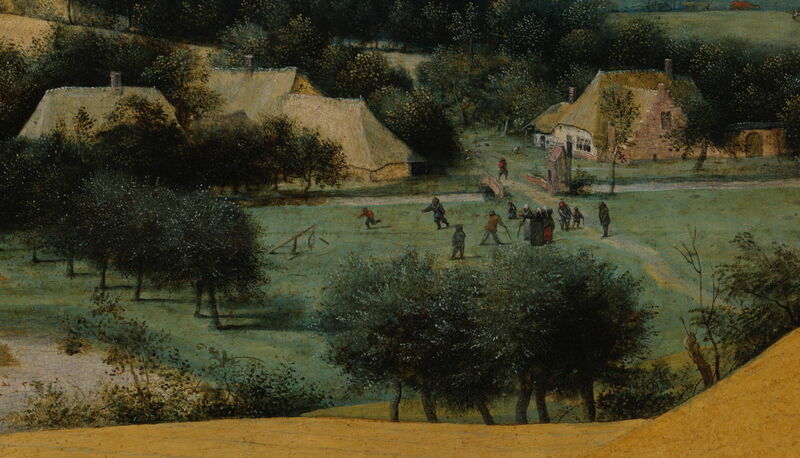 One of the founding fathers of landscape painting, many of Bruegel’s works are rich in figures and human activity. The richest, and probably most deserving of comparison with an Advent Calendar, is his portrayal of Dutch Proverbs (1559). Pieter Bruegel the Elder, Dutch Proverbs (1559), oil on oak wood, 117 x 163 cm, Gemäldegalerie, Berlin. Wikimedia Commons. This is best viewed using the excellent interactive version in Wikipedia, which gives an English translation for each of the proverbs illustrated in the painting. To give just a small flavour of this, I offer a detail which has visual references to no less than eight different proverbs. Pieter Bruegel the Elder, Dutch Proverbs (detail) (1559), oil on oak wood, 117 x 163 cm, Gemäldegalerie, Berlin. Wikimedia Commons. 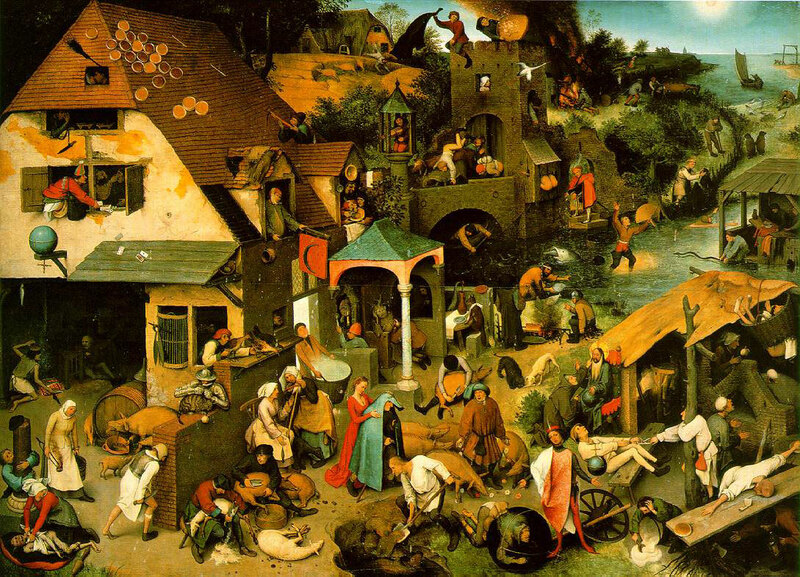 However even for Bruegel this is nothing like a conventional landscape, but an ingenious and amusing contrivance. 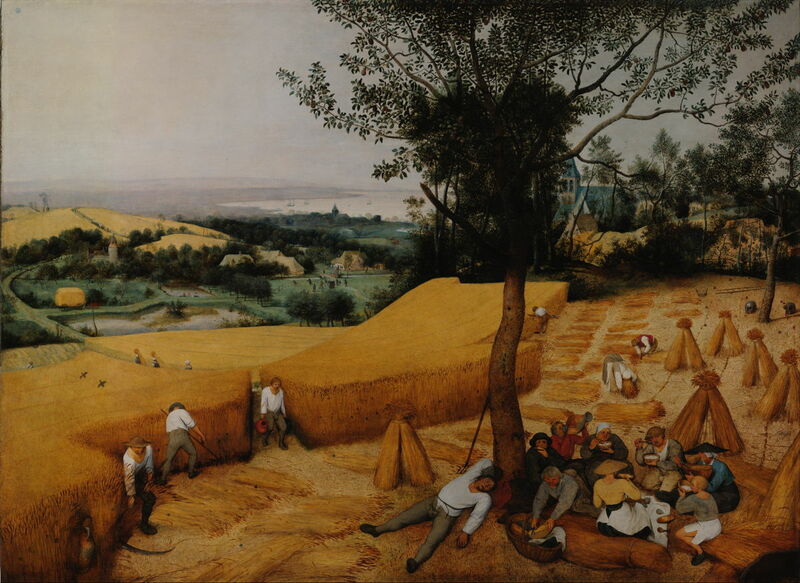 More typical of the details which he puts into his landscapes is The Harvesters (1565), showing grain harvesting in a country landscape, a work hailed by some as the ‘first modern landscape’ painting. 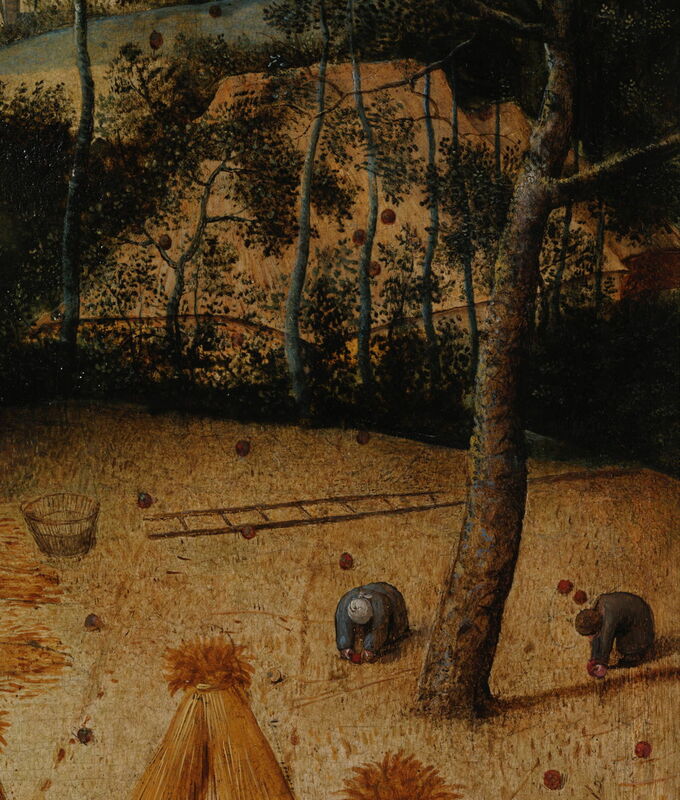 The detailed activities of the harvesters in the foreground are quite plain, whether they are cutting the corn (on the left) or enjoying a meal under the pear tree (centre and right). 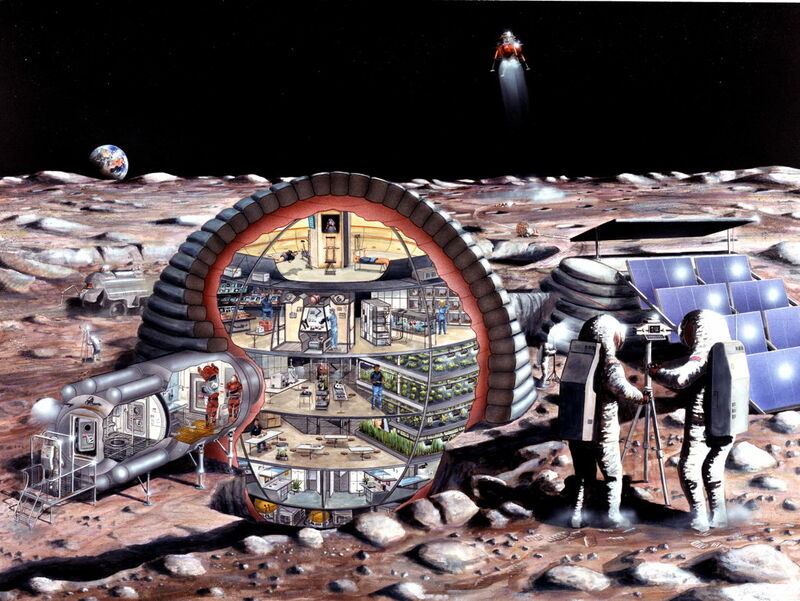 But the detail and narrative extends far beyond the foreground. 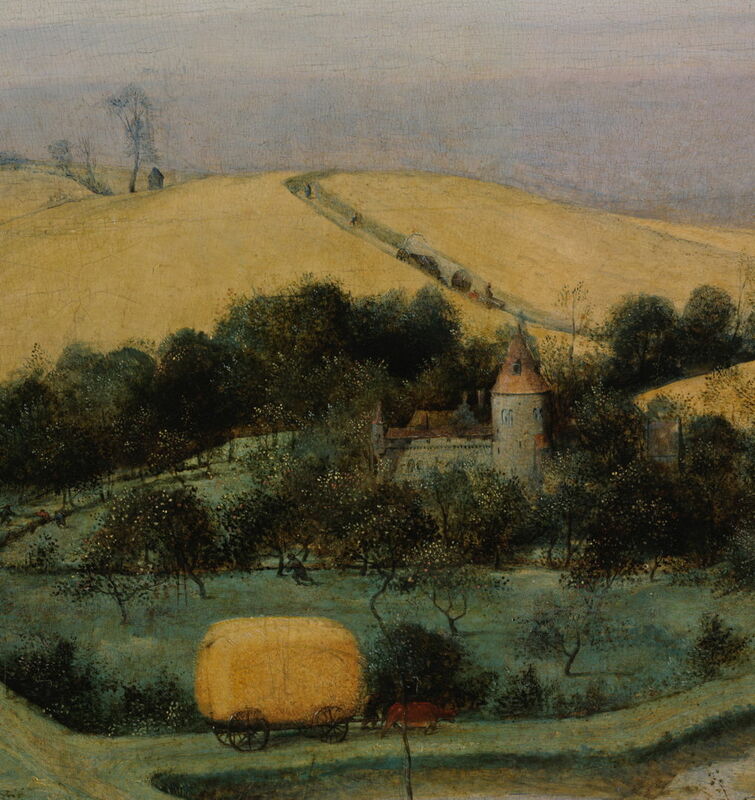 Pieter Bruegel the Elder, The Harvesters (detail) (1565), oil on panel, 119 x 162 cm, Metropolitan Museum of Art, New York, NY. Wikimedia Commons. Together these details narrate the production, harvesting, and consumption of food at the time of plenty, in the late summer. 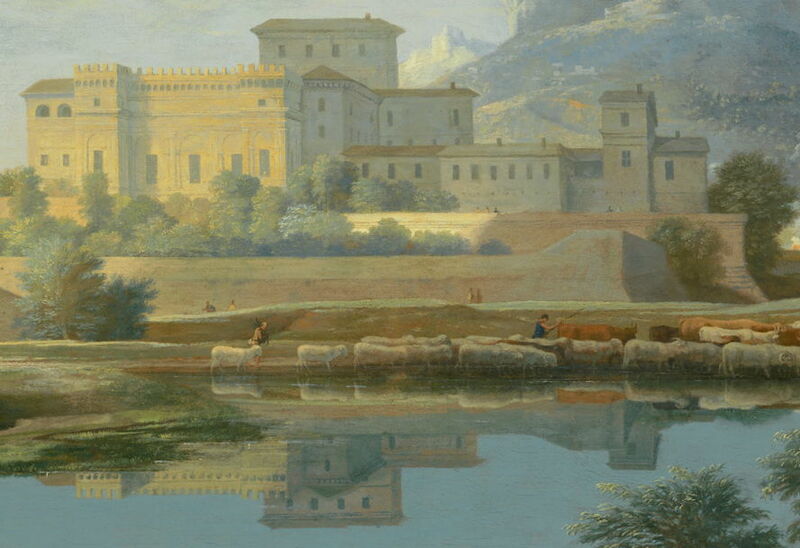 Many of Poussin’s landscapes contain figures and action which are of ‘Advent Calendar’ form. In some, they represent the elements of the narrative, as I described previously for his Stormy Landscape with Pyramus and Thisbe (1651). 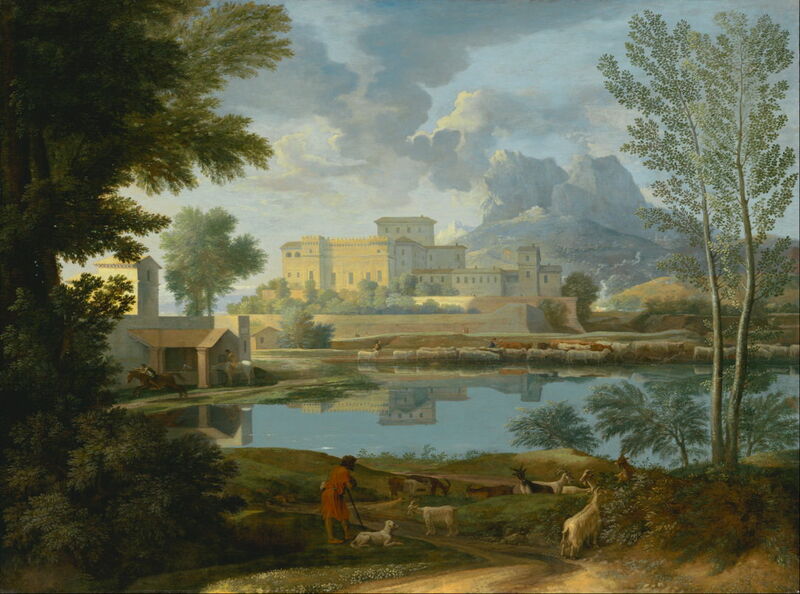 Landscape with a Calm (c 1651) is more of an enigma, as I described in my article in the Favourite Paintings series. Overall this shows a serene landscape under a fair sky, with extensive pastoral references. At the back of the lake, a flock of sheep and a herd of cattle are strung along the water’s edge. 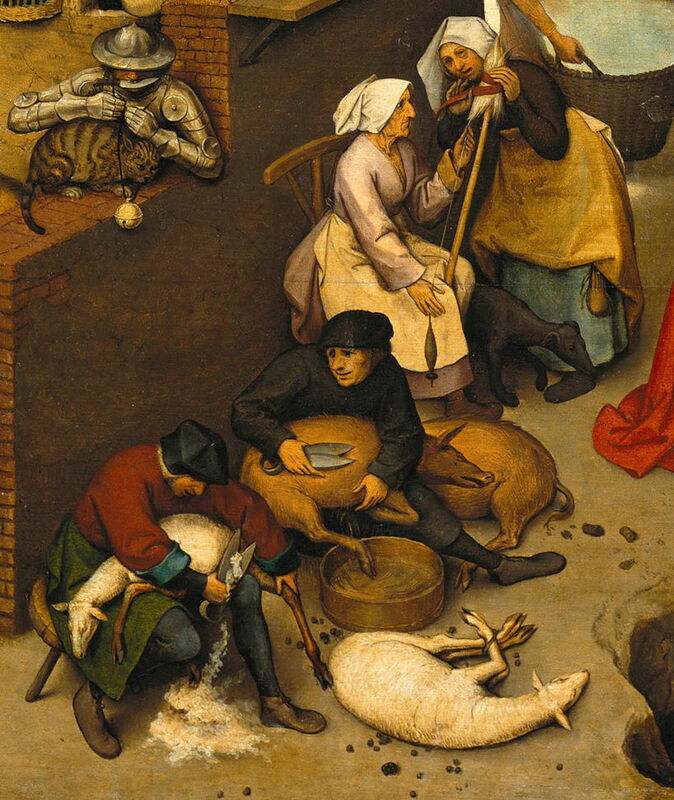 In the foreground, a shepherd, leaning on his crook with his dog beside him, tends a small flock of goats. But look at other details, and all is not as peaceful as it seems. To the right of the central Italianate villa, a fire is burning with bright flames, its smoke wafting erratically up into the air. 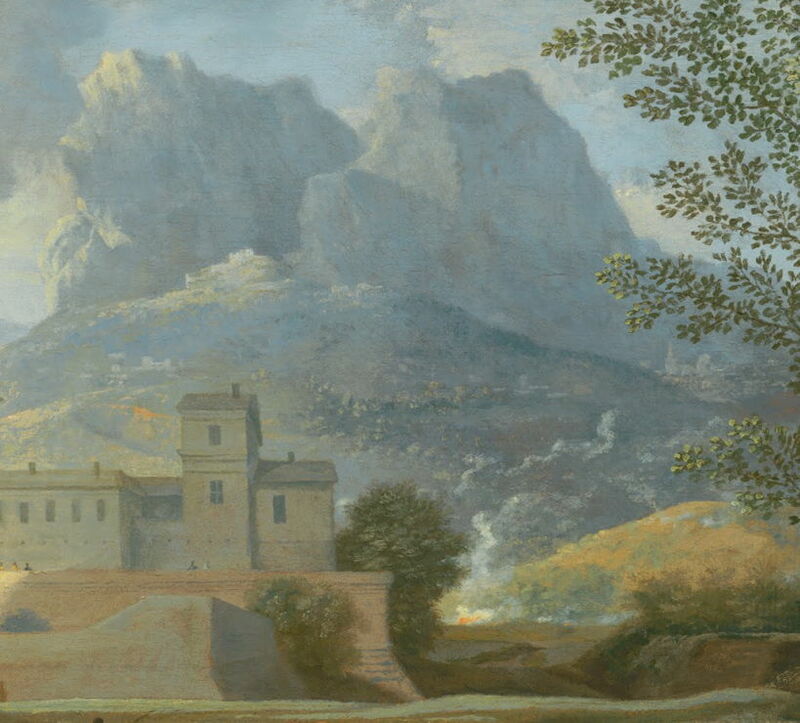 Fire is often taken as an indication of destruction (and Poussin did make a castle on fire a prominent feature of another of his landscapes), but is not out of the ordinary, and may just have been used to add a visual cue to the appearance of calmness and serenity. 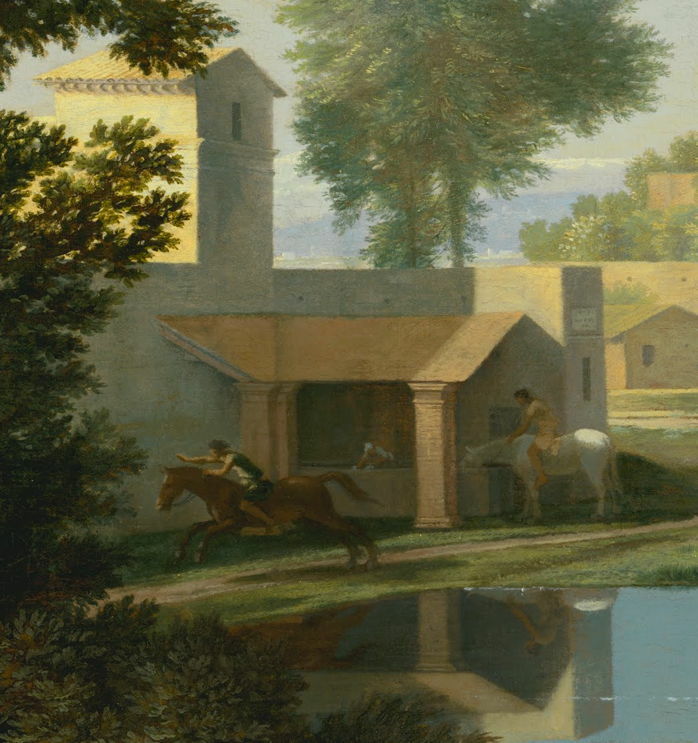 There are horsemen active at the buildings at the left of the painting. One rides away at a full gallop, while another remains on his horse whilst it drinks at a trough under a portico against the building. Horsemen would also have been a common sight around villas of this type and era. However the clear urgency in the rider heading off to the left of the painting, at a full gallop, does appear to warrant more explanation. But we can only speculate whether this would have meant more to Poussin’s client, a Paris banker and silk merchant, as there are precious few clues for us. One of the difficulties and pleasures with these ‘Advent Calendar’ landscapes of Poussin is distinguishing any meaning in the many elements that make up the motif. Are the horsemen here mere staffage, are they symbolic, or part of some narrative or allegory? Given Poussin’s long experience in incorporating such meaningful elements, it is very hard to know. Obvious indicators which would imply that they may have meaning of their own include whether they are unexpected, much like the man killed by a snake in another of Poussin’s paintings (see Clark), or whether they contain visual cues that reference known narratives. McTighe S (1996) Nicolas Poussin’s Landscape Allegories, Cambridge UP. ISBN 0 521 48214 3. Unglaub J (2006) Poussin and the Poetics of Painting: Pictorial Narrative and the Legacy of Tasso, Cambridge University Press. ISBN 978 0 521 83367 7. Although the ‘Advent Calendar’ did not disappear after Poussin, examples seem to become less frequent, and the details less numerous, to the point where Constable’s ‘six footer’ landscapes have quite thin figurative and narrative content. 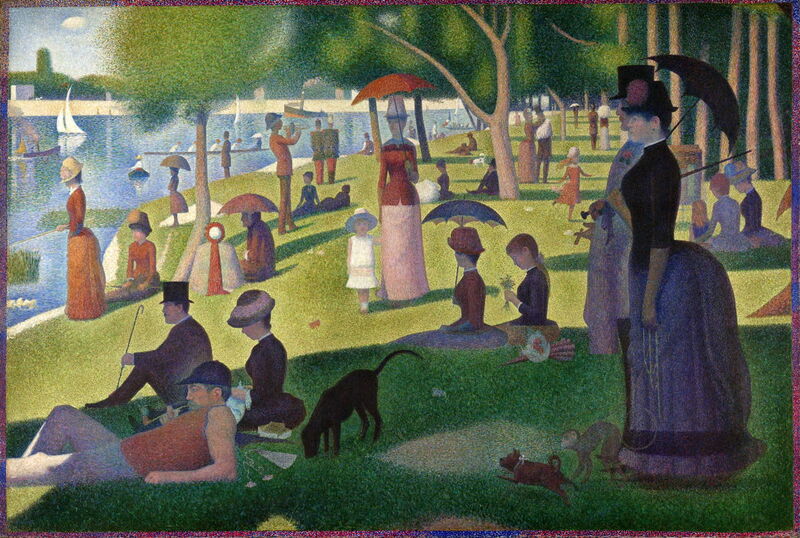 But almost out of the blue, in the mid 1880s, a painting as full of such detail as any of Bruegel’s appeared: Seurat’s La Grande Jatte (1884-6). Those who have counted these added figures claim that there are 48 people, three dogs, and eight boats. Various authors have analysed their social classes, occupations, and the activities in which they appear to be engaged, and tried to construct narratives or meaning from these interpretations. So perhaps in this most elaborate ‘Advent Calendar’, there is neither narrative nor mere staffage, but a more introspective process of criticism. Foa M (2015) Georges Seurat. The Art of Vision, Yale UP. ISBN 978 0 300 20835 1. By a strange coincidence, my last example of an ‘Advent Calendar’ landscape comes from just a couple of years later, but from the Australian Impressionist Charles Conder, whose A Holiday at Mentone (1888) is perhaps his best-known work. Beach scenes had been popular with the European Impressionists too, but this has some distinctly unusual details. The elevated walkway has been claimed to add a Japanese air to an otherwise very Australian scene. 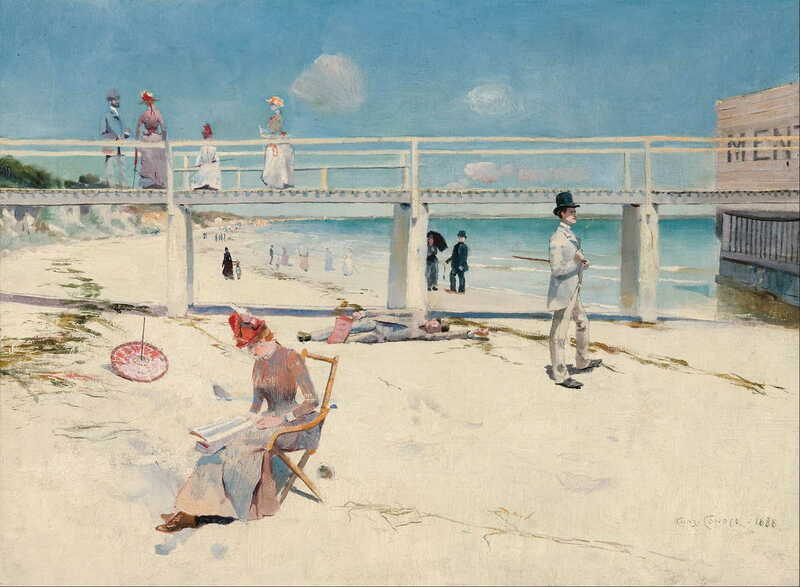 A lone parasol rests on the sand in the left of the painting, although it does not appear to have been missed by any of the numerous people around. Figures in the foreground are curiously dissociated from one another, and from the scene itself: a woman sits in a chair, reading; a man wearing a tall black hat (contrasting with his white suit) stares intently towards the right of the picture, at an unseen object; another man is sprawled asleep, his left arm reaching up at nothing. There appears to be an unresolved narrative, something which others have noted give the painting a surreal tone. In the twentieth century, the Advent Calendar seems to have enjoyed increasing popularity. The works of some Surrealists and those of related movements (Salvador Dalí, Paul Delvaux, for example) appear to consist of a conglomeration of details which challenge the viewer to discover their connection, or may just be intended to evoke a feeling of disquiet and unreality. These elaborately manufactured landscapes are, though, very different from those considered above. His figures therefore may support any narrative in the painting as a whole, but do not appear to form any narrative or meaning of their own. The Lowry – the largest collection of his work. 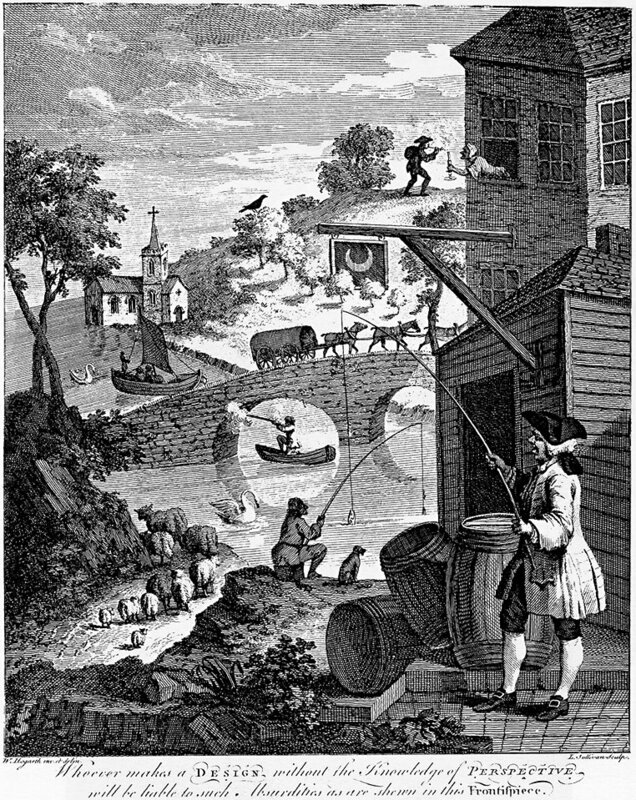 William Hogarth, Satire on False Perspective (1753), engraving for JJ Kirby’s pamphlet on the subject. Wikimedia Commons. The Advent Calendar has also been widely used in print-making (as in William Hogarth’s delightful engraving showing errors in perspective), and of course in illustration, where it reaches its peak in complexity and sophistication, with interwoven narratives spanning every nook and cranny. A good example of the latter is the cutaway. Posted in Painting and tagged Advent calendar, Brueghel, Cézanne, Conder, cutaway, Dalí, Delvaux, figures, illustration, landscape, Lowry, narrative, painting, Palmer, Pissarro, Poussin, print, Seurat, staffage. Bookmark the permalink.